Back of card: Very ornate scrollwork, white on brown. May be inverted. Booklet included: Yes, a long narrow sheet of paper, folded into 14 sections, or panes. Each measures 2.6 x 4.74 inches, or 66 x 120 mm. Comments: This is the Lo Scarabeo edition of the Marseilles deck. To see another version of this deck, go here: AG Muller edition. This deck has usually been issued without an artist's name, but on the side of the box is Mr. Burdel's name, and the year 1751. What is known to us as the Marseilles Tarot is essentially a wood-block reduction of hand-painted Renaissance Italian cards. For many years these were printed in Marseilles, and from there, distributed throughout the European world. 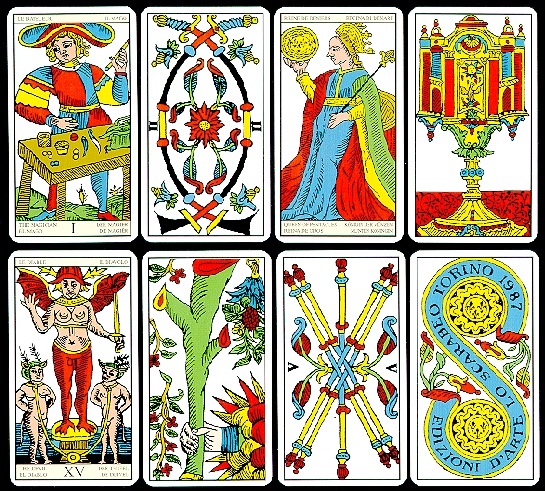 The booklet with the cards is entitled, Learning Tarots and on its cover features cards from eight Lo Scarabeo decks, the Marseilles deck not among them.